Sewell sells her wares at Saratoga Trunk in Downtown Saratoga Springs. When it comes to royalty and racing, I’m in it purely for the hats. The sheer whimsy and impracticality of fanciful cranial adornments have long made them the objects of fantasy for regular folk. And while most of us may not receive an invitation to a wedding at Buckingham Palace, many will have the opportunity to rub shoulders with the smart set at Saratoga Race Course’s Travers Stakes this and every August for many years to come. As a huge fan of dramatic flourishes in both interior design and fashion, it was easy for me to fall for Sewell’s brand of whimsy. 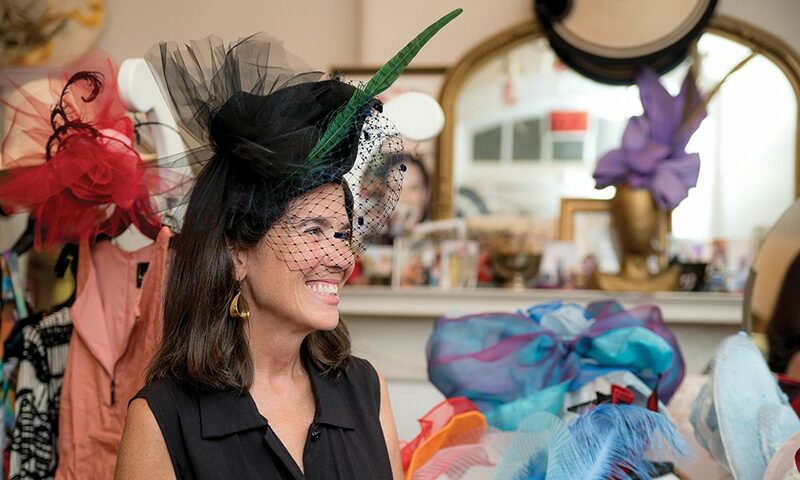 From gravity-defying fascinators to aggressively exaggerated wide-brimmed bonnets, her creations are all one-of-a-kind, created by her alone. “You can find hats at all quality levels and price points here in town, but mine are all stitched by hand—no glue!” she says. At any one time, Sewell has as many as six hats in production, all in varying stages of completion. “It’s a time-consuming process,” she says. One of the creations of which she’s most proud also pushed the ingenuity envelope for Sewell: a commission from a college graduate seeking to transform into Marie Antoinette for her graduation portrait. “I built a model ship, complete with satin sails to incorporate into the design,” Sewell tells me. “That hat weighed quite a few pounds!” They don’t call her a millinery artist for nothing.